Bench space was at a premium in many hobbyists and business owner’s shops. A method to quickly and easily mount vises, grinders, and other tools to the surface of the table would be extremely valuable in these instances. There was no universal quick attach system we have found that can be used to attach multiple different tools to a work surface. By filling this niche Fleenor Manufacturing is able to cater to the group of hobbyists that can benefit from freeing up valuable bench space. Fleenor Manufacturing also gains an add on that could be marketed with current bench systems that they offer. There are quick attach systems available for some devices, but they are limited to specific items. 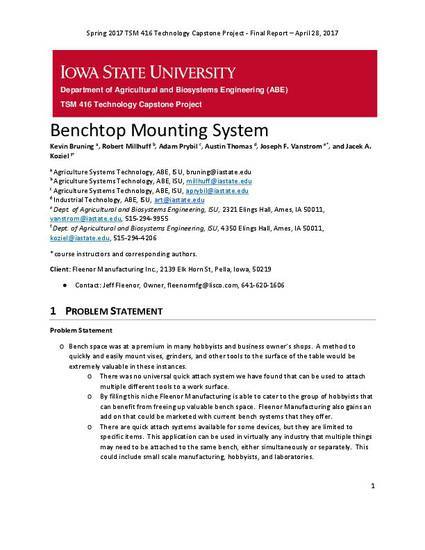 This application can be used in virtually any industry that multiple things may need to be attached to the same bench, either simultaneously or separately. This could include small scale manufacturing, hobbyists, and laboratories. Kevin Bruning, Robert Millhuff, Adam Prybil, Austin Thomas, Joseph F. Vanstrom, and Jacek A. Koziel. Benchtop Mounting System. Final Report. TSM 416 Technology Capstone Project, April 28, 2017.